Best Seller | WHAT A FEELING! The main pleasure of Best Seller comes from watching two of Hollywood’s best actors play off against each other in weird and wonderful ways. James Woods plays a longtime hit man who’s hatching a bizarre plot. 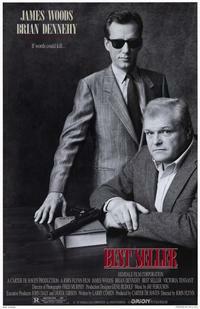 Brian Dennehy plays a cop who is also an author, turning his experiences into books a la Joseph Wambaugh. He’s currently suffering from writer’s block and looking for a story to tell. Woods is about to give him one. He’s murdered a long list of “liabilities” for a stupendously wealthy corporate criminal (Paul Shenar). Now Woods wants to bring down Shenar’s empire, and he knows where all the bodies are buried. He approaches Dennehy with a proposal: Woods will give him the crime story of the century. All Dennehy has to do is get it down right, and maybe humanize Woods in the process. So the two of them forge a dubious partnership; Dennehy, in particular, doesn’t know whether to believe any of this or not. Now, this story is already eccentric—not your usual cops and robbers. But the screenwriter, Larry Cohen, has even more up his sleeve. Which shouldn’t come as a surprise, since Cohen is an original and maverick talent who puts his quirky mark on everything from horror films (It’s Alive) to biographies (The Private Files of J. Edgar Hoover). Although Best Seller contains the requisite guns blasting and cops running down darkened side streets, Cohen and director John Flynn are really fashioning a character study. The hit man and the cop are trapped in this improbable relationship, which keeps getting weirder as Woods becomes more and more insistent on the two of them becoming friends. The cold-blooded killer turns out to be a guy who just wants some brotherly love. He presents Dennehy with an engraved watch, takes him home to meet his parents, and flashes some jealousy at Dennehy’s publisher (Victoria Tennant). The film does a sufficient job of fulfilling the thriller plot while embroidering it with these oddball touches, although the big climax is somewhat wanting, I think. But the two actors make it work. Woods, who was Oscar-nominated last year for Salvador and just won an Emmy for the TV-movie Promise, is simply one of the most exciting actors going. Here he easily slides from cool menace to hurt boyishness. Dennehy is the monument-sized fellow from Cocoon and FX, and his girth plays well off Woods’ lean shiftiness. Dennehy plays the straight man role, but this actor is so authentic that he gives it considerable presence. It’s truly a left-field movie, unpredictable and odd. But there are sequences in it that really reach a high, such as the bar scene in which Woods roams through the room, hitting on a woman, provoking a fitstfight, and testing his pain threshold by burning himself with a cigarette. Best Seller certainly goes its own way. The filmography of Larry Cohen: a great Hollywood subject in itself. I can’t say I remember this movie well, but from the sound of it, somebody could easily do a remake today and make it work. This entry was posted on Friday, March 15th, 2013 at 3:00 am and is filed under 1987, Uncategorized. You can follow any responses to this entry through the RSS 2.0 feed. You can leave a response, or trackback from your own site.